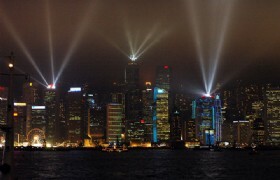 Join in our cruise experience Hong Kong's stunning skyline and magnificent harbour view on Harbour Cruise. 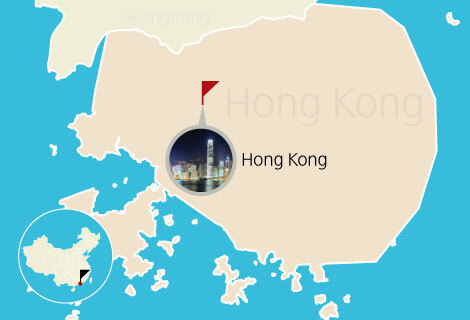 Hotel pickup is available from hotels in Kowloon only. Detailed Itinerary: Our English speaking tour guide will pick you up at 7PM-7:30PM. Your tour will finish at 9:30PM. Every day, we pick-up from hotels in Kowloon. Cruise starts from Hung Hom Ferry Pier, Kowloon. It depart at 20:00, disembark at 21:30. 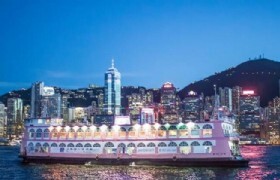 For guests staying on Hong Kong Island side, pelase arrange your own transportation to Kowloon Hotel (Address: 19-21 Nathan Road, Tsim Sha Tsui) at 19:20. 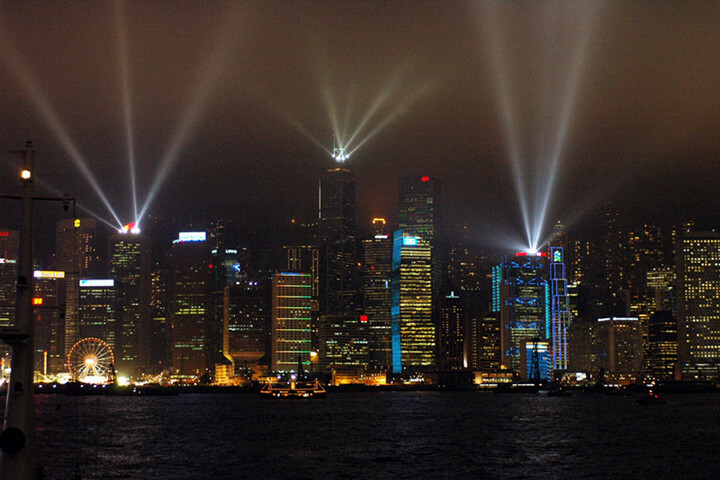 After the cruise, we will send you back to hotel by coach, no matter your hotel is in Hong Kong Island or in Kowloon. 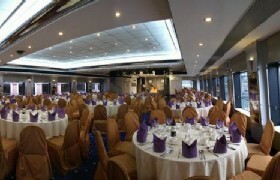 Savor a sumptuous buffet dinner while a live band plays aboard the restaurant cruise liner- Harbour Cruise Bauhinia. Dance the night away, or relax and enjoy a view of the glittering city and the magnificent harbour. Synchronised building exterior decorative light and laser multimedia display, featuring 44 buildings on both sides of the Victoria Harbour of Hong Kong accompanied by music. The technology was developed by Australian firm Laservision. It has attracted over 4 million visitors and locals so far, and is held every night for ten minutes. A Symphony of Lights is staged every night at 8:00 p.m. It has been awarded the world's "Largest Permanent Light Show" by Guinness World Records. Central is the central business district of Hong Kong, it has served as the centre of trade and financial activities from the earliest days of the British colonial era in 1841, and continues to flourish and serve as the administrative centre after the transfer of sovereignty to China in 1997. * Countdown fireworks cruise for New Year's Eve (22:00-00:20, 22:35-00:35, 23:00-01:15. If you are looking for a cruise for special holidays, please contact us. We will tell you the price and reserve a seat. Bauhinia Dinner Cruise will have special arrangement on 21 February 2017 (Tuesday), the dinner cruise will be not be served on the day. This tour will not be operated on 21 February 2017 (Tuesday). For guests staying on Hong Kong Island side, pelase arrange your own transportation to Holiday Inn Golden Mile (Address: 50 Nathan Road, Tsim Sha Tsui) at 7:20pm. 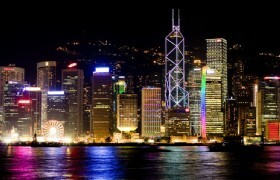 Return transfer to Hong Kong and Kowloon hotel is provided for all guests.